• Postmarketing reports indicate that the effects of all botulinum toxin products may spread from the area of injection to produce symptoms consistent with botulinum toxin effects, including asthenia, generalized muscle weakness, diplopia, blurred vision, ptosis, dysphagia, dysphonia, dysarthria, urinary incontinence, and breathing difficulties. These signs and symptoms have been reported hours to weeks after injection. Swallowing and breathing difficulties can be life-threatening, and deaths have occurred. • The risk of signs and symptoms is probably greatest in children treated for spasticity, but signs and symptoms can also occur in adults treated for spasticity and other conditions, particularly in patients who have underlying conditions that would predispose them to these symptoms. • In unapproved uses, including spasticity in children and adults, and in approved indications, cases of spread of effect have been reported at dosages comparable to those used to treat cervical dystonia and at lower dosages. Blocks neuromuscular transmission by binding to receptor sites on motor nerve terminals and inhibiting acetylcholine release, thereby causing localized muscle denervation. As a result, local muscle paralysis occurs, which leads to muscle atrophy and reinnervation due to development of new acetylcholine receptors. Xeomin-Or, 20 units per treatment session divided into five equal I.M. injections of 4 units each. Adults: Xeomin-When initiating therapy, base dose, number, and location of injections on the previous dosing of onabotulinumtoxinA (Botox). If previous dose of Botox isn't known, the recommended starting dose is 1.25 to 2.5 units per injection site. Adults: Botox-75 to 360 units I.M. divided among selected muscles at a given treatment session. Dose can be repeated no sooner than 12 weeks after the previous injection. Adults: 1.25 to 5 units injected into eyelid (dosage varies with strabismus severity). Dose can be repeated in 7 to 14 days if patient has adequate response; with inadequate response, dosage may be doubled. Adults: Xeomin-120 units injected I.M. into affected muscles per treatment session. Adults: Botox-Usual dosage is 236 units injected I.M. locally into affected muscles. Dosage ranges from 198 to 300 units. Dysport-500 units I.M. as a divided dose among affected muscles in patients with or without a history of prior treatment with botulinum toxin. Myobloc-2,500 to 5,000 units I.M. injected locally into affected muscles. • Be aware that only trained professional medical personnel should inject this drug. • Be aware that botulinum toxin products aren't interchangeable. • Reconstitute by slowly injecting preservative-free normal saline solution into drug vial. • Rotate vial gently to mix drug; then draw up at least 20 units (0.5-ml solution) and expel air bubbles. • Remove needle used for reconstitution, and attach 30G needle. Then inject drug as divided doses of 0.1 ml into each of five sites (two in each corruga-tor muscle, one in procerus muscle). • Prepare eye with several drops of local anesthetic and ocular decongestant, as prescribed, several minutes before injection for blepharospasm or strabismus. • When administering for upper limb spasticity, dilute with preservative-free normal saline solution to 200 units/4 ml or 100 units/2 ml. Then, using a 25G to 30G needle for superficial muscles and a longer 22G needle for deeper musculature, inject no more than 50 units per site. • Reconstitute each 300-unit vial with 0.6 ml preservative-free normal saline solution and each 500-unit vial with 1 ml preservative-free normal saline solution. • Swirl vial gently to mix drug. • Remove needle used for reconstitution. Use a 23G to 25G needle for administration. Then inject 10 units into each of five sites (two in each corrugator muscle and one in the procerus muscle). • Use within 4 hours of reconstitution. • Draw up prescribed dose from preservative-free, 3.5-ml single-use vial. • Divide prescribed dose and inject locally into affected muscles. • Stay alert for signs and symptoms of anaphylaxis, particularly after first dose. • Monitor vital signs and ECG, watching for evidence of hypertension, arrhythmias, and MI. 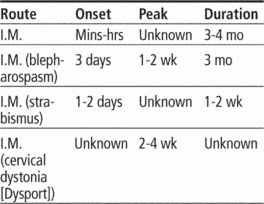 • Assess effect of drug on affected muscles; check for paralysis. ☞ Be aware that spread of toxin effects may lead to swallowing and breathing difficulties and death. Provide immediate medical attention if respiratory, speech, or swallowing difficulties occur. • Monitor temperature. Watch for signs and symptoms of respiratory and EENT infections as well as flulike symptoms. ☞ Instruct patient to seek immediate medical attention if respiratory, speech, or swallowing difficulties occur. • Teach patient about desired effect of injection. Advise patient to report paralysis. • Instruct patient to report signs and symptoms of infection, particularly flulike illness and EENT and respiratory infections. • Inform patient being treated for ble-pharospasm (uncontrollable blinking) that he may experience transient eyelid drooping, corneal inflammation, double vision, dry eyes, tearing, and light sensitivity. A trademark for a preparation of botulinum toxin, used to treat blepharospasms, strabismus, and muscle dystonias and to smooth facial wrinkles. trademark for a preparation of botulinum toxin, type A. See botulinum toxin. Botulinum toxin A, see there. A brand name for a powder used to reconstitute a solution of botulinum A toxin complexed with haemagglutinin. This is used to treat a wide and increasing range of conditions. See BOTULINUM TOXIN. pdf) full report from 2015, ASAPS revealed that cosmetic procedures had increased by 39 percent from 2011, and nonsurgical procedures 6 like Botox 6 were up by 44 percent. The medical literature is sparse when reporting the use of Botox in patients with MG. According to Dr Marwan Al Zarouni, consultant plastic surgeon with the Dubai Health Authority (DHA), botox is entirely safe, provided it is of good quality and being used by a professionally qualified plastic surgeon. The ASA said Dermaskin's website included claims that went beyond factual references and were a direct promotion of the Botox, such as "this revolutionary treatment. The FDA evaluated the drug's safety and efficacy for overactive bladder through two studies in which 1,105 patients were randomly assigned to receive injections of 100 units of Botox (20 injections of 5 units each) or placebo. KATIE PRICE GLAMOUR model Katie Price, once known as Jordan, has made no secret of using Botox and getting fillers. But researchers from the Mayo Clinic have found that Botox doesn't promote weight loss. Justement, a qui faut-il s'adresser pour se faire des injections de Botox ? But should you be having botox in the first place, at a time when half of Hollywood claims to be giving up its needle fix? So now Botox Mom is saying she was paid to say all the things for which she is now being criticised. During the recession, those that could not afford full surgical procedures opted for treatments such as Botox, dermabrasion, and tissue fillers. Does Botox deaden more than facial muscles?